Place: Living room, dining room, study room, bedroom, hallway, balcony etc. Desk Light and all the necessary accessories. TypeBedside Lamp. Assembly required. Light SourceHalogen. ColorClear,White. Light Source: E27. 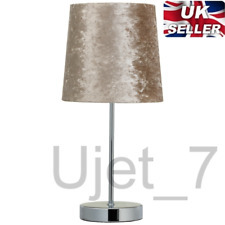 Beautiful new modern charcoal grey crushed velvet table/bedside lamp. Colour: Shade. Charcoal grey. Base Chrome Approx measurements: Height 40cm Brand new. Max 9W Candle Energy saving bulb. Or 40W E14 bulb On/Off Push Switch. This gorgeous elegant charcoal grey crushed velvet table lamp, with a chrome base, will look stunning placed in your lounge or bedroom. Or any room in your home. Elegant and stylish. A lovely addition to your home. Thanks for looking. Thank you for your purchase. Please take a look in my shop for more home treats. ** Please contact me if you have any issues with your purchase, I will do my very best to resolve any problems. Great Working Lamp, Comes Complete With Cord & Plug. Perfectly working lamp. In great condition and comes complete with cord, plug and shade. Also comes with a working bulb. Perfect for a bedside lamp. Luminous flux: 285LM. The halogen table lamp Len flirts with gravity. 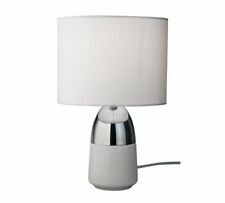 This table lamp is the focal point of your modern interior. The glass bulb distributes the light evenly. So you can be sure that there is sufficient light available for every room. Spread the sparkle! 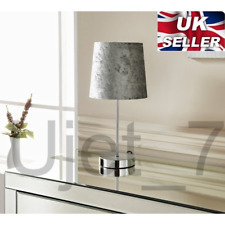 Our silver table lamp is glittery and glamorous. Bright and sparkly, this fun shade really lights up a room. In-line switch. Assembly required. We go above and beyond to ensure you receive the best level of service. It requires 1 x E27 bulb which is not supplied. CE Approved. E27 Desk Lamp - White. BS approved plug. Plug Format 3 pin British. We go above and beyond to ensure you receive the best level of service.